Insult is added to injury for beleagured printer Quebecor World as it appears its parent company's magazine division may move some of its printing business to other suppliers. This, on top of the threat of losing the printing of The Economist, the loss of all of Rogers Publishing's magazines and the discontinuation of the 9 million press-run Canadian Tire catalogue. According to a story in the Globe and Mail, Publications TVA Inc., Quebec's largest consumer magazine publisher, is considering entering into alternative printing arrangements. "Publications TVA is assessing the possibility of letting a minority percentage [of its magazines] go to other printing companies, for practical and logistical reasons," [company spokesman] Luc Lavoie said. Mr. Lavoie said no final decision has been made yet on whether to go with other printers for some titles and that the "vast majority" of the 50 or so magazines in the TVA stable will continue to be printed by Quebecor World. He would not provide further details. Among titles of Outrement, Que.-based Publications TVA are several highly popular celebrity gossip magazines, including 7 Jours, Le Lundi and Star Système. The online site of Masthead magazine, the magazine industry trade publication, has been completely and substantially revamped. One dramatic change is that almost all of its content is now free to anyone, with the exception of its resource library; the news service, with original reporting, is now called the Premium News Service (although there is no premium). For the first time, comments are allowed, forums and RSS feeds are provided. Michael Brooke, founder of skateboarding title Concrete Wave is acting as forum moderator, saying it is a hybrid blog and forum, where readers can respond to his posts, but can also start their own conversational threads.Also, for the first time, Masthead has created a roundup of magazine news from outside of Canada. Many of these changes reflect things that the Canadian Magazines blog has provided for three years now; whether this causes a migration of readers over there from here, we shall see. She will see through one more round of funding for Ontario literary and cultural magazines then Lorraine Filyer, literature officer for the Ontario Arts Council will be retiring in October. After some health problems this past spring and summer, she says she felt it was time to move on, but she intends to remain active in the small magazine sector. She has not only represented the interests of magazines in the broader arts mandate of the OAC, but every year shepherded them through a jurying process that resulted in grants to more than 30 titles -- many of national importance -- totalling (most recently) more than $450,000 a year. Before joining the OAC in 1990, she was the formidable managing editor of This Magazine. Antonio DeLuca, art director of The Walrus, is presenting a seminar on April 10 in Berlin with Dr. Frederike Grist of Akademie der Bildenden Künste Nürnberg called Drawing the Line: The Future is Illustrated. It is part of the Art Director's Club of Germany Congress. DeLuca is the only Canadian presenter at the event. It's official, as if anyone needed a scorecard: newspaper revenues have dropped off a cliff or at least fallen down a very steep and slippery hill. Editor & Publisher has reported the Newspaper Association of America data that total print advertising revenue in 2007 plunged 9.4% to $42 billion compared to 2006 -- the most severe percent decline since the association started measuring advertising expenditures in 1950. The only glimmer of good news was that internet ad revenue was up in 2007 by 18.8% to $3.2 billion compared to 2006. But even that seems to be slowing down: in 2006, online ad revenue had soared 31.4% to $2.6 billion. In 2005, it jumped 31.4% to $2 billion. Print is generally more trusted than the web in almost every area, says a new study by agency MediaVest, reported in Advertising Age. "Print offers something very, very unique, specifically around trustworthiness and authoritativeness," said David Shiffman, senior VP-connections research and analytics at MediaVest. "The personal experience people have with it is very different from what they're looking for and getting in the digital world." The web beat print for trustworthiness in one area: health and wellness, where readers preferred digital sources such as WebMD by 3%. "The research is going to help publishers develop and steer their content in the appropriate direction," said Robin Steinberg, senior VP-director of print investment at MediaVest. "When most magazines first launched their sites, they didn't have the correct approach of utility, immediacy and customization. They were basically taking content from the magazine and putting it online. Research such as this helps publishers to create online environments and experiences that align with user expectations of the online world vs. the offline or in-book." People are seven times more likely to turn to print for fashion and beauty content, the research found. And print coverage of food and cooking was more trusted by a 7% margin; print entertainment news was more trusted by 5%. There remains very low duplication between the audiences for print publications and their online companions. Duplication ranged from 1% to 6% for every category except entertainment, where some titles reached duplication rates of 10%. Print titles should deliver something different with their online extensions, according to 79% of respondents who were dual magazine and digital users. But only 44% said they strongly believed that publishers' sites really offer something unique. Print will never die. Only 12% of respondents said they strongly believed that a publisher's site could easily replace the print product within the next five years. MediaVest is a full service advertising and media buying agency, a division of the Starcom MediaVest Group (SMG), a subsidiary of Paris-based Publicis Groupe. . Fashion magazine from St. Joseph Media has partnered with MySpace Canada to create a fashion hub myspace.com/fashionca where readers can interact with their favourite designers, learn more about what inspires them, see their collections and even get a behind-the-scenes look at their studios and fashion shows. It will including news, video, interviews and contests and the magazine will feature a daily feed on its fashion page. According to a story in Media in Canada, the site already had 1,300 friends only a couple of days after its Monday launch. It is one whammy after another for Quebecor World. Not only is it effectively disowned by its parent company, Quebecor Inc. (one of Canada's leading magazine publishers through its media division), but it also is desperately trying to renew a contract with the Economist, which served notice last week. (See earlier posts. )And now, Canadian Tire has announced that it is discontinuing its iconic paper catalogue after 80 years. The reason? Most people are accessing the catalogue's contents online. With its decision goes the not inconsiderable business of printing the estimated 9 million copies of the catalogue in English and French. While it is not strictly a magazine story, the end of the Canadian Tire catalogue is a real marker in the changing nature of the print marketplace. Things like directories and catalogues so naturally lend themselves to the searchability and quick updating that the web allows (encourages)that printing and mailing them is becoming not only uneconomic but also no longer sensible. Canadian Tire customers are being informed about the change, ironically, through this week's printed flyers. While such flyers may continue, their role now will be more and more to drive people to the web. The catalogue content will, of course, continue online in some form. "We've done a lot of research around customer shopping habits and the reality is, with consumers, they really are spending a lot more time online, that's where they go to obtain the information they're looking for," Lisa Gibson, a spokeswoman for Canadian Tire, told the Canadian Press. "There's a lot of research out there that says the readership and retention of annual catalogues is declining, and obviously, as a result (of the change) you're saving that many catalogues from being printed and then ending up in the recycling or garbage." The Canadian Tire decision won praise from environmentalists. "Catalogues have a tremendous environmental impact, from forests that are clear cut to produce them to the energy consumed during manufacturing and delivery," stated ForestEthics' Gillian McEachern. "(The) announcement by Canadian Tire demonstrates that dramatically reducing paper use makes good business sense." Effective immediately the IMS group will report to Andrew Crane, who has been taking a leadership role in the development of a long term strategic vision for St. Joseph Media’s web operations. The Information Technology group will now also report to Andrew.Andrew will continue to be responsible for the Production team. [This post has been updated.] Jim Everson, who is the principal public affairs advisor in Ottawa for Magazines Canada, has accepted a position as the Canola Council of Canada's vice-president of corporate affairs according to a story in Canadian Cattlemen magazine. As hard as it is to believe Everson might give up dealing with the ins and outs of the PAP and the Department of Canadian Heritage, that's not the case; he will continue to work on a part-time basis, as before, for Magazines Canada. However the new position, also part-time, is a natural fit. As someone who runs his own farm west of Ottawa and was at one time chief of staff to then-Canadian Wheat Board minister of state Charlie Mayer in the Brian Mulroney government, he'll be representing the interests of the $14 billion rapeseed industry in the halls of power. Born in Montreal and raised on a 600-acre eastern Ontario farm, Everson worked for the federal government for seven years, moved into private sector government relations and then established Everson Public Affairs in 1998. This is a list of what Paper Cuts, the New York Times book blog, says are the seven deadly words of book reviewing – words that aren’t bad in themselves, but which crop up with “wearying regularity” in book reviews. Jessica Rose, a hip young artist and designer with little direct magazine experience, but with a considerable resume for someone of 29, has been named Toronto Life's new art director. She replaces Carol Moskot, who left the magazine in 2007 to launch Jewish Living Magazine in New York. In the interim, the magazine has been designed by veteran art director Louis Fishauf. According to a Toronto Life release, Rose played a key role at the Drake Hotel in Toronto where, from 2003 to 2005, she was its in-house art director and curator. She has also worked as a designer for Pod 10 Art & Design, a firm led by the highly regarded creative director Carmen Dunjko (former art director of Saturday Night) that branded the Drake, Soulpepper and the National Ballet of Canada. In 2005, Rose was one of the organizers of the inaugural Nuit Blanche, the annual city-wide all-night arts festival, and curated the exhibition “My Secret City” in 2006. The Toronto-based magazine Muslim Girl, which has most of its 50,000 circulation in the U.S. is launching a digital edition to plump up its readership in the United Kingdom. 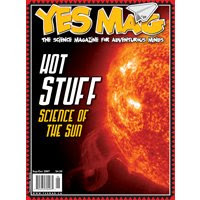 According to a story in UK Press Gazette, the magazine now has a mere 1,000 print distribution in Britain and demand demonstrated by a digital edition may result in a UK print edition. The magazine is published by ExecuGo Media in Toronto and distributed worldwide by RCS in Los Angeles. Magazine people who believe that the cover is sacrosanct (as set out in the advertising:editorial guidelines published by Magazines Canada and the Canadian Society of Magazine Editors) may blanch at the initiative taken by the current Canadian print run of Vice. 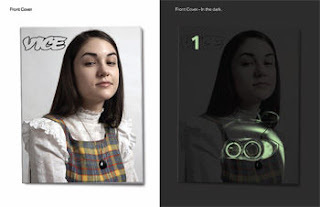 While it looks like a normal cover, it is printed so that -- when the lights are out -- a glow-in-the-dark ad for BMW 1 Series automobiles appears superimposed with a number 1 where the "i" in Vice would be. The ad is intended to create a buzz, although the audience of Vice isn't exactly the target group for these pricey cars. "Maintaining the integrity of our cover - which is not usually for sale - while delivering a unique and rad brand message for BMW was an amazing challenge." To pull off the challenge, the magazine had to be printed at one plant, then shipped to another to add the glow-in-the-dark element, UV coat them and then shipped back to the original plant for binding to the rest of the mag. Sunni Boot, president/CEO of Toronto-based ZenithOptimedia, has been elected to the board of the Audit Bureau of Circulations to represent Canadian advertisers. This, according to a story in Media in Canada. ABC Canada is one of two main circulation auditing firms for magazines and newspapers in Canada (the other is CCAB/BPA). Boot succeeds M2 Universal president/CEO Hugh Dow, who retired from the board in January after 20 years. ABC's other Canadian directors (out of 36 on the largely U.S. board) are: Brian Segal, president/CEO, Rogers Publishing at Rogers Media; Dennis Skulsky, president/CEO, publishing at Canwest; Bruce Claassen, chairman at Aegis Media Canada; and Robert Troutbeck, president of Troutbeck-Chernoff. Time Canada in Montreal has lost its long-time contract as the point of contact and subscriber service for the Guardian Weekly and other Guardian Media products in Canada. Customer service is now the responsibility of U.K.-based Quadrant Subscriptions Services, with all North American subs being dealt with out of Orlando, Florida. Quadrant is owned by Reed Business Information - RBI, part of the multinational Reed Elsevier Group plc. Jim Shenkman, the founder of Brunico Communications Ltd., publishers of Playback, Strategy, KidScreen, RealScreen and 'Boardsmagazines, has stepped down as acting chairman, a position he held for the past year, since the company was sold to a group of investors led by now-president/CEO Russell Goldstein. "After 22 years, I'm ready for change," Shenkman said in a story published in Playback and Strategy and on the Media in Canada website. His future plans include continued involvement with the International Centre - a Toronto convention facility for which he sits on the board of directors - and is in talks to help produce a conference for an unnamed non-profit organization. Shenkman is also looking for investment opportunities in entrepreneurial companies looking to grow outside of Canada. "I'd rather be investing than managing day-to-day." 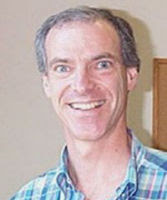 Shenkman, a lawyer, got into publishing after a failed attempt in 1985 to win a bid for a Toronto radio station license. "I had been frustrated by that," he recalls, so he channeled that interest in media towards publishing when he realized there was no business press coverage of the radio industry at the time. "There was only Broadcaster magazine, but it was not really talking about business news, it was more about equipment." So Shenkman joined forces with former Marketing magazine associate editor Mark Smyka in 1986, and together they launched Playback (a biweekly which now focuses on the business of TV and film in Canada) and its parentco Brunico Communications in August that year. (Brunico is named for a small town in Italy). Style Director Hilary Kelley, former fashion and beauty editor at More magazine. We've demonstrated that format (trim size, paper stock) is more important than ever in a digital age. At the same time, we've challenged the subscription model and convinced readers to pay more for quality -- Monocle's subscription is 50% higher than its cover price. The American Society of Magazine Editors have announced the nominees for its Ellies awards, so named after the elephant sculpture by Alexander Calder that winning titles receive. According to an ASME release, there were a record-setting 1,964 entries from 333 print and online magazines and 25 winners out of 128 finalists will be announced on May 1 at a New York gala. The New Yorker leads with a total of 12 nominations. Twenty-six other titles received multiple nominations: New York (9), Vanity Fair (6), GQ (5), National Geographic (5), The Atlantic (3), Popular Mechanics (3), T, The New York Times Style Magazine (3), The Virginia Quarterly Review (3), Wired (3), Aperture (2), BusinessWeek (2), Domino (2), The Economist (2), Field & Stream (2), Good (2), Gourmet (2), Harper’s Magazine (2), Martha Stewart Living (2), Men’s Health (2), Mother Jones (2), The Nation (2), The New York Times Magazine (2), People (2), O, The Oprah Magazine (2), Slate (2) and W (2). Twenty-two of the finalists are based in cities outside of New York (Athens, GA; Atlanta, GA; Boulder, CO; Charlottesville, VA; Chicago, IL; Decatur, GA; Denver, CO; Emmaus, PA; Kansas City, MO; Los Angeles, CA; Northampton, MA; Philadelphia, PA; San Francisco, CA; Washington, DC; West Hollywood, CA). First-time finalists include Babble, Bloomberg Markets, Budget Travel, Chow, Condé Nast Portfolio, Domino, Good, The New York Times Magazine, Paste, Play:The New York Times Sports Magazine, Radar, and T, The New York Times Style Magazine. Several traditional print categories (Reporting, Public Interest, Feature Writing, Profile Writing, Essays, Reviews and Criticism, Columns and Commentary, and Fiction) were opened to include articles published online only. Here is the expanded finalists' list, including title, editor, article and issue. The Canadian Society of Magazine Editors' say it's the last chance to enter their Editors' Choice Awards. Entries have to be in by Monday, March 24. 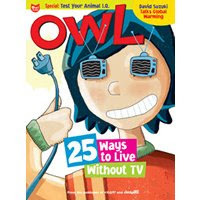 Several Canadian children's magazine have been awarded medals in the annual Parents' Choice Awards, honouring excellence in reading matter and products for children. 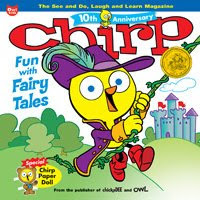 Chirp, published by Bayard Canada. The awards, begun 28 years ago, are presented by the Parents' Choice Foundation of Maryland which rates not only books, magazines and newspapers, but also toys; anything that "help kids grow – imaginatively, physically, morally and mentally—fairly priced products that are fun, safe and socially sound." Magazines ad share in the U.S. Unlike other non-internet media, magazines' ad share in the U.S. continued to grow during 2007, according to information released by the Magazine Publishers of America (MPA). It grew by one point to nearly 18.5%. The only other medium to match magazines in media share growth is U.S. Internet online display advertising (which does not include Search), with share growth of one point, from 6.4% share in 2006 to 7.4% in 2007. All other non-digital media except for Outdoor showed declines in share. The information is based on the latest advertising revenue data from TNS Media Intelligence.Overall advertising expenditures for 2007 was almost flat, rising only 0.3% versus 2006. It should be remembered that such data is based on rate card pricing and doesn't necessarily reflect discounting or off-rate-card sales. The biggest hazard in most magazine fashion shoots is a broken nail or boredom while endless setups take place. But for Desi Life magazine, owned and distributed by the Toronto Star, it was somewhat more dramatic. According to a story in the Star, a martial arts teacher was knocked over by a lion during a photo shoot at Bowmanville Zoo. She came away with four broken ribs and a bloodied lung. The photo session happened a month ago and the final cover photo that resulted will be published today (Thursday). The incident with the lion was videotaped, however; not to miss the promotional opportunity, the Star waited until yesterday to report on the incident and post a video of it on its website. "To be honest, the sensation I have is a great deal of gratitude to be alive," Gitanjali Kolanad said yesterday. Kolanad, 54, practises the ancient Indian martial art of Kalaripayat, fashioned after the movements of such animals as an elephant, wild boar or peacock ...and a lion. 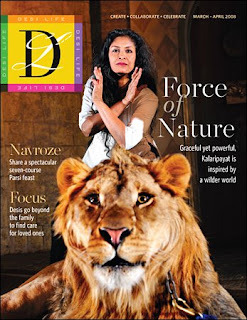 It was the magazine's suggestion that she pose with a lion. "I thought, 'Sure – Photoshop,'" Kolanad recalled. When she understood better, she was excited, she said, and an appointment was made with "Leo" for Feb. 20. The video of the session shows editor Sonia Verma knocked momentarily off her feet then picking herself up and smiling. It next paws the legs of photographer Richard Lautens. Off-camera, it also took a swipe at the legs of art director Spencer Wynn. "I felt it for a couple of days," he said. The 3-year-old lion was lying nearby when Kolanad began her movements. Apparently still wanting to frolic, the animal jumped up and fell on her, knocking the wind out of her, bruising her left lung and breaking four left ribs. It was not an attack, the witnesses said. The lion's mouth was not open and Kolanad was not scratched. For his part, Leo the lion was born in captivity and grew up surrounded by people. At age 3, he’s more like a frisky puppy than a predator. He made friends with all of us at the shoot and was soon rolling on to his back to have his tummy rubbed and knocking us over with unexpected head-butts. Yet, even at his most playful, there was no disguising this gorgeous animal’s strength and power, and Gita’s every move took on an extra dimension of grace and power. As we wrapped up our shoot with an increasingly rambunctious Leo, he decided to have one final frolic with Gita. Our model wasn’t facing him and didn’t see the 400 pounds of good-natured wildlife hurtling her way until it was too late. Jake Bogoch, a former staffer at SBC Skiing magazine of Toronto has been named editor of Skiing magazine, based in Boulder, Colorado. He is promoted from being senior editor for the past two years. "Jake is the kind of skier you'd want to ski with. He's the guy who will unlock the secrets of the mountain and take you to the best spot to have a drink at the end of the day," says Tom James, editorial director, in a release. "The new Skiing magazine will reflect Jake's knowledge of the sport and his willingness to share it." Skiing has announced a redesign which will be unveiled in September, the magazine's next issue. "I've been a skier and reading ski magazines since I was a kid," says Bogoch. "To take the helm of this iconic, 60-year-old brand is a lifelong dream come true and a big job. For anyone who knew me during my half-decade as a ski bum, the irony should be unbearable." Skiing is published six times a year by Bonnier Corp. and has a circulation of about 300,000. (SBC Skier, based in Toronto, claims about 60,000, though it is not currently audited.) Bonnier publishes more than 40 special-interest publications. Our format - larger than traditional magazines - gives designers extra room to show off great images, and our paper stock will enable us to really demonstrate them in all their glory. It’s a winning combination. News International, the Rupert Murdoch multinational, is opening what it calls the biggest printing plant in the world. The result will be dramatic and wide-ranging improvements in the deadlines and the redesign of pages in its four national newspapers when all of them move later this year to the new Broxbourne plant in North London from the current premises in Wapping. It will be interesting to see whether such a show of confidence -- in fact an act of faith -- from one of the biggest international players will give courage to smaller battalions in the struggle for audience in the face of the web. James Murdoch, the chairman and chief executive of News Corp's Europe and Asia division, said the investment "should be ample answer to those who believe the business of journalism, in print, is a business for yesterday's readers, not tomorrow's." The changes will affect the Sun, the Times, News of the World, the Sunday Times and the London Paper, boosting their pages of colour editorial and advertising. The new £187 million Broxbourne plant is only one part of a £650m investment including plants in Knowsley, near Liverpool, and Motherwell, near Glasgow. 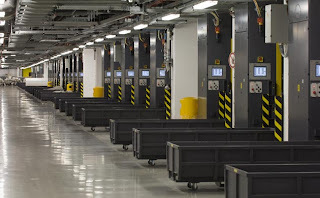 The Broxbourne plant is the size of 23 football fields, with 12 full-colour printing presses capable of printing 86,000 copies per hour -- almost 3 times what can be done now. The "triple-width" printing presses can produce tabloid and broadsheet newsprint simultaneously, meaning that many traditional editorial and printing deadlines could be scrapped. For instance, the Sunday Times, which currently begins printing on Wednesdays, could now be printed entirely on Saturday, making more sections "live" and providing full results from Premiership and Champions League football matches available across the country for the first time. According to a story in the Guardian, NI commissioning MAN Roland to create presses that can handle six pages simultaneously rather than the standard four - making the Broxbourne operation 50% more efficient in one hit. All this with only 450 staff, two-thirds fewer than ran the presses at Wapping. Even Guardian columnist Roy Greenslade, well-known for pronouncing on the impending death of print, was impressed. "I've never seen anything like it before in my life." As well it might, the Museum of Modern Art in New York is celebrating the Esquire covers of George Lois in an exhibit that runs for a year, from April 25 through to March 31, 2009, in the Museum’s Philip Johnson Architecture and Design Galleries. It features 32 of the 92 iconic covers Lois created in the 1960s in what many people in magazines still consider a "golden age". A release from the MOMA notes that, before advertising executive and art director Lois was given a free hand by editor Harold Hayes, as part of his plan for revitalizing the flagging magazine, even the most celebrated magazine covers suffered from a banal, formulaic style, and often text competed with the image. Lois stripped the cover down to a graphically concise yet conceptually potent image that venturedbeyond mere illustration of the feature article. He exploited the communicative power of the mass-circulated front page to stimulate and provoke the public into debate, pressing Americans to confront controversial issues like racism, feminism, and the Vietnam War. These images hit the public with their messages artfully communicated with force and immediacy. Initially received as jarring and prescient statements of their time, the Esquire covers have since become essential to the iconography of American culture. The very first cover that Lois produced for the October 1962 issue heralded an upcoming heavyweight title fight with a picture of the favourite, Floyd Patterson, sprawled on the canvas. knocked out by Sonny Liston and alone in the arena. It generated the largest newsstand sales in Esquire’s history. Lois freely assembled montages, mixing photography, art and retouching, as when he spoofed pop art by having artist Andy Warhol sinking in a can of tomato soup, or had Muhammed Ali posed as the martyr St. Sebastian, pierced with arrows symbolic of the campaign against him for refusing to serve in Vietnam. 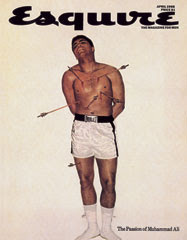 During the photo shoot, Ali named each of the arrows after his tormentors: General Westmoreland, Defense Secretary Robert McNamara, and President Johnson, among others. The image was so popular that it was later reproduced as a protest poster. There are biographical details and a thumbnail gallery of the covers available on Lois's own website. The Economist magazine has applied to the courts to be allowed to give Quebecor World formal notice at the end of the month that it wants to terminate its printing contract with the troubled company, a division of Quebecor Inc. According to a story in the Globe and Mail, the prestigious customer filed a motion in U.S. Bankruptcy Court in the Southern District of New York. Because Quebecor World is in Chapter 11 bankruptcy protection, there is a standstill on changes to any contracts. The company wants that stay lifted to allow notice to be given. “The Economist is being harmed by the continuance of the automatic stay since the stay is all that prevents The Economist from exercising its undisputable contractual right to terminate the printing agreement by timely serving a written notice to terminate,” says the filing. The Economist's move follows on the decision last month by Rogers Publishing to move printing of all of its consumer and trade magazines to Transcontinental Media at the end of next year. 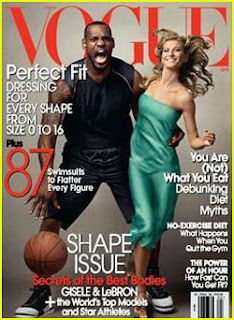 Some controversy is afoot over the latest Vogue magazine cover featuring basketball superstar LeBron James and supermodel Gisele Bundchen, particularly among African Americans, according to an item from Radar magazine. While no one questions the historical importance of James' cover appearance—he's the first black man ever to be so featured—word in the black blogosphere is that the cover plays into the old stereotype of the black man as a savage in search of a prized white woman. Some have gone so far as to say it evokes the dreaded imagery of King Kong, and question the choice of photo when a less highly-charged alternative was available. Masthead magazine's annual tally of starts and stops in the magazine business is being published in its next issue. According to mastheadonline (sub req'd), the number of starts and closures have both declined in the past year, with the biggest decline in the b-to-b sector, where only 5 books were launched. Total launches in 2007 dropped 15 per cent from 2006. On average, measured over 10 years, about 60 consumer magazines are launched. Fashion Week is in high gear, particularly in Toronto, and as part of the celebrations, the 6-year-old New-York-based fashion/lifestyle book Z!nk has given birth to a huge (304 pages in its premiere edition) quarterly, Canadian edition. Z!nk was co-founded by Canadian-born model Isabelle Sabourin and the magazine "targets a unique set of influencers, capturing the imagination of industry insiders and the consumers who follow their lead," says editor-in-chief/publisher Sheriff J. Ishak - the husband of Sabourin. Canadian luminaries featured in the magazine's premiere Canuck issue include: photographers Geoffrey Barrenger, Paco Garcia and Duncan Mackenzie, designers Renata Morales, Paul Hardy and Marie Saint Pierre, and Adrian Mainella, host of CBC's Fashion File. As hard as it may be to imagine, the cadre of usual corporate backers of Royal Ontario Museum exhibits shied away from sponsoring an exhibit celebrating Charles Darwin, the author of Origin of the Species and coiner of the term "survival of the fittest". However, according to a story in the Toronto Star, the show goes on with a couple of unlikely sponsors: The United Church Observer magazine and the Humanist Association of Canada. The Humanist Association provided $50,000 in support of the touring exhibition. Pat O’Brien, President of HAC said: "The ROM’s Director & CEO, William Thorsell opined on CBC Radio that while evolution and Darwinism may be controversial topics in the United States, he did not expect the same to be true in Canada. As the use of the scientific method is advocated as one of the principles of Humanism...we strongly felt that this wonderful exhibition deserves our best support." Darwin: The Evolution Revolution explores the life and work of Charles Darwin, whose work nearly 150 years ago fundamentally altered views of the origin and nature of all species, including our own. The exhibition is on display until Monday, August 4, 2008 in the ROM's Garfield Weston Exhibition Hall of the Michael Lee-Chin Crystal. The ROM is the first Canadian venue to host the show during its international tour. Whoever said that illustrated covers don't work (it was probably a circulator, or a wholesaler) should look at the current issue of L’actualité. I'd say that was a pretty arresting, attention-getting and excellent cover for the public affairs magazine. It's not altogether surprising that Rogers Publishing's trade magazines, having pulled their membership from the Canadian Business Press recently, have largely refrained from entering the Kenneth R. Wilson awards (commonly known as the KRWs) that are run by CBP. According to a story in mastheadonline (sub req'd), with the deadline passed, fewer than 10 entries were received for the 2008 KRWs. Phil Boyd, the president of the Canadian Business Press said they would normally expect 175. Boyd would not confirm an actual figure, but Masthead estimates less than 10 entries were received, which would put the loss of revenue for the CBP at around $14,000. Rogers also pulled its $2,500 sponsorship of the awards earlier this year. No Rogers editors were present at the KRW Peer Judging panel held last week. Several Rogers entries came from freelancers, Boyd said. Rogers and some other trade publishers are known to be in conversation with Magazines Canada about offering membership and services to b to b publishers or creating some sort of trade publishing division. The situation is pregnant with irony since Kenneth R. Wilson, the man after whom the awards are named, was a well-respected Ottawa Editor of the Financial Post and worked for Maclean Hunter, the predecessor to Rogers. In its first quarter, Transcontinental Inc. recorded a 4% increase in revenue company and an increase in adjusted operating income of 9%, despite significant foreign exchange losses. Net income grew by 69%, from $20.2 million Q1 of 2007 to $34.1 million in 2008. On a per-share basis, net income rose 71%, from $0.24 to $0.41. Consolidated revenues were $596 million, up from $572 million in the same quarter of 2007. Adjusted operating income rose to $ 82.4 million, compared to $75.7 million in 2007. A large part of these were the result of acquisitions such as that of the PLM Group, the company said, which more than offset exchange losses in U.S. and Mexican currencies. 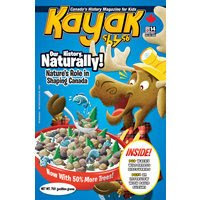 the announcement that Transcontinental Media, Canada's largest consumer magazine publisher, announced that it had won the contract to print all Rogers' Publishing magazines, more than 70 titles, including Chatelaine, Maclean's, L'actualité and Canadian Business. This contract, valued at about $210 million, represents all new business for Transcontinental and takes effect on February 1, 2009, at which time Transcontinental will become the largest catalogue and magazine-printer in Canada. The worldwide magazine empire of Hachette Filippachi is making almost all the difference for Lagardère Active and Lagardère SCA, which owns it, according to a story in MediaDaily News. Revenues were up 3.3% over all compared to 2006. mostly due to improved performance at its magazine properties and online acquisitions in 2007, including Jumpstart, an auto ad network. Hachette is owned by Lagardère Active and is the company that franchised one of its standout titles, fashion giant Elle, to Transcontinental Media, which publishes both Elle Quebec and Elle Canada. 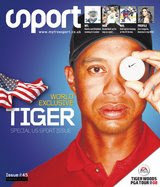 It also publishes such well-known U.S. titles as Car and Driver, Road and Track, Metropolitan Home and Woman's Day. Lagardere also owns Curtis Circulation Company, one of the largest distributors of magazines, with retail sales of $1.7 billion a year. The Paris-based Lagardère SCA had roughly $13.3 billion in revenues according to current exchange rates. Magazine sales, including U.S. and overseas titles, rose 1.3% to $2.7 billion, despite costs associated with the closure of some unprofitable magazines. (Hachette shuttered Premiere in March 2007 in the U.S.) The company's core magazine business performed well, especially women's and celebrity titles. According to a separate report from TNS Media Intelligence, Hachette's total ad pages slipped slightly in 2007--down 3.7% to 14,146. Hachette is just one of many magazine businesses owned by Lagardere. Znaimer maintains his claim to have invented term "zoomer"
Recently in the Globe and Mail wordmeister Warren Clements took issue in his March 8 column with Moses Znaimer's claim that he invented the term "zoomer", which he is using to rebrand CARP magazine. Well, all good wishes to Znaimer, but he can't to have coined zoomer. In The Globe's pages alone, it has been around for years. Guy Dixon wrote in 2003 of a television commercial by advertising giant Young & Rubicam Inc. that "takes direct aim at the latest stage in baby boomer development - zoomer culture. These are boomers who feel half their age and want the world to know it." Two years earlier, The Sacramento Bee in California attributed the word "zoomers" to Del Webb, a developer of age-restricted communities for those 55 and over. In The Globe, Michael Kesterton's Social Studies quoted a brochure that defined a zoomer as "a no-limits baby boomer who sees retirement as the fast lane to a more energetic new life characterized by healthy living, a high level of physical activity, a quest for further learning, and who possesses technological and financial savvy." (The mangled syntax is sic.) In 2000, something called Promo magazine wrote that "aging Baby Boomers are turning into 'Zoomers,' yet another Boomer force to be reckoned with." I applied to the Canadian Radio-television and Telecommunications Commission for a channel that I called Zoomer in 2002. Since it takes approximately a year to create a CRTC application, and since I was speaking about the Zoomer idea internally for more than a year before that, I place my first use of the term at about 10 years ago. I came upon it by combining "Boomer with Zip" or, to be frank, "Znaimer with Boomer." 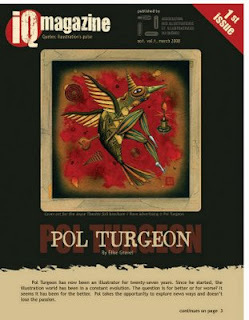 The March 2008 debut issue includes a feature interview with Pol Turgeon, a rundown of various exhibits and shows, and information about emerging talents Stefan Defago and Marie Mainguy. 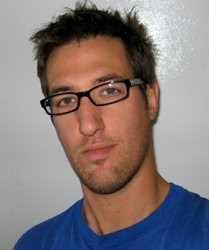 The magazine is edited by Jacques LaPlante. Heavens to murgatroid. On The Atlantic's upcoming cover. Advertising Age is all over it. Which means it can't just be an early April Fool's joke (can it?). Admittedly, the ever-growing celebrity journalism industry is worthy of being discussed seriously. But how about this cover treatment, folks? Canadian Lawyer magazine has published a list of what columnist Gerry Blackwell considers the Top 10 legal blogs in the country. A few years ago, blawging — blogging by lawyers — was almost unheard of. Now dozens are doing it in Canada; scores, possibly hundreds, are doing it in the U.S. When dipping into a new blawg, I count comments. The more there are, I figure, the more people are reading — a sure sign of a blawg worth reading — and the greater the chances of lively exchanges. That being said, absence of comments, as we’ll see, doesn’t necessarily mean a dull or worthless blog. Manitoba magazine people will want to consider signing up for the Magazine Makeover weekend offered by the Manitoba Magazine Publishers Association (MMPA). It's on March 28 and 29 at the Fairmont Hotel in Winnipeg. Keynote speaker on Saturday is Lisa Tant, Editor-in-Chief Flare Magazine discussing the Flare makeover experience. A day-long InDesign workshop with Andrew Klapatiuk on Friday. Participants should have some InDesign experience or knowledge and are encouraged to bring their own laptops. Software will be available for use during the session. Copy editing workshop with Cynthia Brouse. What are the new rules? Where does that comma go? Do you even need one? Cynthia will guide you through some common grammar dilemmas and provide a fact checking primer. Penni Mitchell of Herizons discussing "going green" and the response from their readers. Joanne Bristol of Border Crossings and Space Cadet’s Bill Reburn will share the process of Border Crossings' recent website redesign. Jamis Paulson of the MB Writers' Guild will present alternatives - in-house site design and maintenance - the how to. The full weekend is $250 for MMPA members. For more information or to register, go to the website. As part of its pre-launch campaign the new women's health magazine Best Health (from Reader's Digest) is asking for reader-generated video health tips (maximum 3 minutes). While it seems a little complicated for what amounts to a $1,000 first prize (interested entrants have to sign up for a YouTube account, join a group, upload the video and go somewhere else to register in the contest) a couple of entries have already been posted. Well, it seems that the right of free speech doesn't apply to private corporations, particularly media corporations. Adbusters magazine has been turned down by the British Columbia Supreme Court in a bid to bring to trial two of Canada’s television networks that refused to sell the magazine commercial airtime. Adbusters argued that the CBC and Canwest Global had violated the Canadian Charter of Rights and Freedoms. But the court's refusal to let the case proceed effectively means that the Charter does not apply in this case, (according to an Adbuster's press release). The magazine has until the middle of March to appeal the decision by Mr. Justice William Ehrcke. Firstly, why are Canwest and the CBC selling as much time as they possibly can to corporations, while fighting expensive legal actions to keep citizen-produced messages off the air? Why does the CBC call itself “Canada’s Public Broadcaster” if they won’t sell airtime to citizens? Secondly, why is the CRTC not standing up for public access? When they grant licences to broadcasters, why is the right of Canadian citizens to access their own “public” airwaves not being guaranteed? Thirdly, why is our freedom of speech being suppressed? Why can corporations buy airtime while citizens cannot? Why doesn’t the Canadian Charter apply to the most powerful social communications medium of our age - television? The Magazine Publishers of America announced Monday that, in cooperation with McKinsey and Company, it proposes to launch a new system of magazine measurement based on total readership rather than circulation. The proposed system could transform the generally accepted metrics for larger U.S. magazines. Advertisers would be able to get issue-specific data on key demographics, individual ad recall and self-reported consumer action and purchasing intent. The goal would be to have such data available within three months for monthlies and two months for weeklies. There is clearly a desire for a magazine measurement system that is comparable to other media, as well as more timely and accountable to advertising results. Advertising effectiveness measurement in other media is derived from an audience, viewership or readership metric, and it is therefore important that magazine measurement is comparable to other media, particularly as multi-platform packages gain traction. Using readership metrics is a better model, not only for advertisers but for our magazines’ relationship with their readers. This initiative will help our consumer marketers and editors better understand readers’ needs and behavior through improved measurement tools and direct marketing materials, which will become even more targeted to what readers want. In Canada, most large magazines already sell principally on readership as measured by the Print Measurement Bureau, although only on an annualized basis. There will probably be pressure now from agencies for at least the larger Canadian titles to provide more frequent and timely audience metrics. Brian Segal, the President and Chief Executive Officer of Rogers Publishing, is to be given an honourary degree from Ryerson University during fall convocation, October 22. Not coincidentally, he was president of the university from 1980 to 1988 before becoming president of the University of Guelph. What we're learning is that in an era where people have choices, the job of every print publication is to add value to the web. If you're a newspaper, and I say this as someone who loves newspapers, arguably you're a value-subtract medium -- the same product, but 18 hours late and it leaves smudgy ink on your fingers. If you're a monthly magazine, you are doing something the web doesn't do. It is long form, 8,000 words, photography, design, lavish spreads on high stock. I believe in these kinds of magazines in the same way I believe in books. A book is a superior product to reading the same material as text on a screen...I think a book has a place in the 21st century and I think a magazine [does] things that don't work on the web. And that is a good place to be for the magazine industry in the future. The other senior editor's position is to be filled by Sylvia Barrett, who was senior editor at Canadian Geographic in Ottawa. It is understood she is to commute to Toronto during the week to do the job. Prior to CanGeo, Barrett was Science Editor and later Managing Editor of the late Equinox magazine. She won two gold medals in the National Magazine Awards for science writing, a Michener Award for excellence in public-service journalism, and honorable mention in the competition for The Washington Journalism Center's Thomas L. Stokes Award. Her book The Arsenic Milkshake and other mysteries solved by forensic science (Doubleday 1994) was short listed for both the Science in Society Book Award and the Arthur Ellis Award for non-fiction crime writing. She is also vice-president of the National Press Club of Canada. "Don't disrespect rich people's respect for money." -- Rachel Gaudoin, editor of the soon-to-be-published glossy quarterly from the Wall Street Journal, quoted by Women's Wear Daily. The good news for people invested in print is that newspaper average weekday readership in Canada is up, according to 2007 readership results released by the Newspaper Audience Databank Inc. (NADbank). The less good news is that almost all of that growth is due to to free, commuter dailies like Metro and 24 Hours. The NADbank study also found that online readership of newspapers is growing and is highest in St. John's, Nfld., where 27 per cent of adults read an online edition each week. In the highly competitive Toronto market, according to a story in the Toronto Star, Metro's readership jumped 16.6 per cent to 434,600, making it the second leading paper in this city behind the Star. The number of Toronto adults reading a printed edition of any daily newspaper on the average weekday increased by 1.8 per cent to 1,999,300. Torstar Corp. publishes the Star and owns half of Metro. Rival freebie 24 Hours, owned by Quebecor's Sun Media Corp., mustered a 0.8 per cent increase to 348,500 readers. Nearly half of surveyed adults read a printed newspaper on the average weekday; of course that means the other half don't or didn't. The Star itself reported its average weekday readership, as reflected by the "read yesterday" figures, recorded a 3 per cent decline, to 952,800 in Toronto. "Given our recent investments in the newspaper, including a major redesign that makes it easier to read and handle, and given the positive response by readers to those investments, we are surprised by this result," said publisher Jagoda Pike. "But given the readership declines seen in most large Canadian markets, the Star is more than holding its own." The Globe and Mail increased its Toronto readership by 7.3 per cent to 409,300, the Toronto Sun sank by 12.3 per cent to 424,100, and the National Post lost a marginal 0.8 per cent to 223,200. It's an interesting approach that Magazines Canada is taking to promoting magazines as an advertising medium. There has always been a lot of printed and online information provided, augmented by occasional seminars, but now they have launched magblast, a series of short video podcasts about particular aspects of magazines as part of the advertising and marketing mix. The first of these features Michele Beaulieu, Senior Vice-President and Group Media Director of Starcom Worldwide,talking about reader engagement and permission marketing. The podcasts complement the regular advertising e-letter Page that Magazines Canada has published for several years. Blackberry users can now get free access to mobile versions of Maclean's and Canadian Business magazines. The applications have been developed by a company called Polar Mobile. These are not homescreen shortcuts, more of an RSS feed reader. 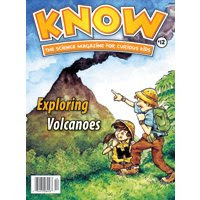 The application allows you to download new issues of the magazines and notifies you when new versions are available. You can view a demo here. 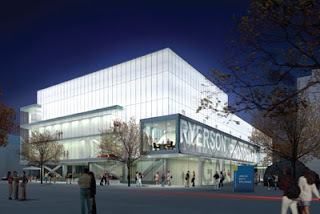 Ryerson University in Toronto has unveiled the design concept for the new Ryerson Photography Gallery and Research Centre, which is to house the univerity's world-renowned Black Star Historical Black & White Photography Collection, as well as the many collections in the School's Mira Godard Study Centre. Designed by Diamond and Schmitt Architects the 1,860 square metre centre is part of an expansion and redesign of the existing School of Image Arts building at 122 Bond Street. There will be a new public gallery on the ground floor. "We have designed a Photography Gallery and Research Centre for Ryerson University which will undoubtedly be a shining star in the city's cultural firmament," said Donald Schmitt, principal-in-charge, Diamond and Schmitt Architects. Ryerson's Black Star Historical Black & White Photography Collection is considered the most significant cultural contribution ever made to a Canadian university. The gift was accompanied by a $7 million financial contribution, which will be put towards construction of the centre. In addition, Ryerson will launch a fundraising campaign to seek a naming donor for the facility, and to solicit support for other elements of the project such as exhibits and programs. Canadian Dimension magazines from Winnipeg carries a sober, disturbing story in its March/April issue about the devastation of northern Alberta native communities by the tar sands developments. Canadian policymakers, says Clayton Thomas-Müller, need to understand that there is an inextricable link between indigenous rights and energy and climate impacts. All English and French-language Canadian magazines are eligible to enter the Canadian Newsstand Awards, which recognizes excellence in newsstand sales and cover. $15,000 worth of promotion credits for HDS Retail-owned stores and other prizes are available to be won. 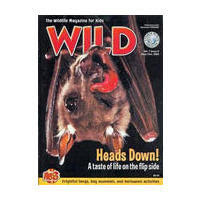 Covers are judged on total newsstand sales, sell-through, quality of promotions and overall appearance. Entrants compete in four categories, based on circulation size, from small to extra-large. The entry deadline is Friday, April 11. Winners will be announced June 3 at Magazines University in Toronto. Finalists will be exhibited during Mags U, June 2-4 and at the National Magazine Awards, June 6 at the Carlu. Matt O'Grady, who had a brief hiatus outside the magazine business after leaving Western Living, is back in harness as the editor of BC Business magazine. It is published by Canada Wide Media Limited. Among other projects, Hambly and Woolley designed the logos for both Magazines Canada and for the National Magazine Awards. Perhaps it is a sign that something is going to happen, at long last, on the Canadian Freelance Union front. The CFU now has a Facebook page, administered by Michael OReilly, the CFU president and Jessica Johnston, the editor of This Magazine. So far 22 "friends" have signed up, though the fledgling organization says it has more than 400 members. The CFU has been collecting preliminary memberships at $25 each and is saying that the long-delayed first annual general meeting will be happening soon. For background, see previous posts. Editors are always right, aren't they? Like any good relationship, the one editors have with art directors should make life easier, not a daily battle of wills. If your art director is causing your hair to fall out or keeping you up at night, you can easily remedy the situation by showing him the door. Nobody is that artistically gifted. So says Mark Newman, the editor of Southern Breeze, in a recent blog item for Folio:. He argues that there needs to be mutual respect and an understanding that the editor and art director of a magazine are partners, but that the editor is the senior partner. You show me an art director with too much power and I’ll show you a weak, ineffectual editor who has no business being at the top of the masthead. Powerful art directors are intrinsically responsible for redesign after elaborate redesign that typically signals the last throes of a magazine’s existence. Of course, Newman's point of view was not universally applauded, as evidenced by the following anonymous comment to his item. Art directors are rarely given the credit they deserve. It's often ironic that a visually driven magazine will often be cited as a success because of the editor, when the art director is actually making all the choices. This really started in the 80s, after very powerful art directors worked for Esquire, Look, Harper's, etc., seemed to lose their power. Computers, as much as a godsend also made art directors production artists, retouchers and typographers. While art directors were busy learning Quark and Photoshop, editors went about the job of editing. In the end, it is a mix, a marriage, and a relationship. "Nobody is that artistically gifted." I can only imagine working for this guy must be hell. 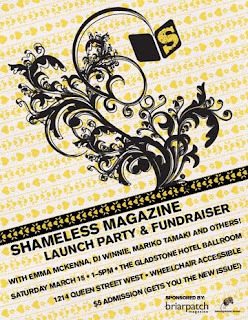 Shameless magazine is having a launch party and fundraiser, an afternoon affair of music readings and raffles and a booth where you can print your own T-shirt, all in support of this important little magazine for teen girls and its blog. The party's on Saturday, March 15 from 1 to 5 p.m. at the Gladstone Hotel, 1214 Queen Street West in Toronto. $5 for admission includes a copy of the new issue. One of the interesting things about the event is that the lead sponsor is another little magazine, Briarpatch from Saskatoon, whose theme in its March-April issue is gender politics. This may not be the first time a fellow magazine provides raffle prizes, but to our knowledge it's rare for them to be highlighted like a corporate sponsor. Actually, a good idea if it's a symbiotic relationship. We imagine the favour will be returned by Shameless.